With it's mild climate, special history, and thriving modern day commerce, Granada does well to conceil it human numbers (including throngs of tourists) in the hills that enclose the city. Something in the air of southern Spain allows these people to retain their courtesy and charm even in the hectic pace of today. It was as you will recall the last outpost of Moorish Iberia before they were finally ousted in the same year that Columbus took off for the Bahamas. On the left is the hill of the Albaycin as seen from the Alhambra and on the right is the view down to the main city from the ramparts of the Alcazar. While hoards of tourists bus on up the Alhambra hill to view the maganificance of the Moorish palace, most of the cazbar like activity of local flavor (and night life) happens on the Albaycin hill. If you are able to navigate the maze up the hill, you are in for a genuine treat. 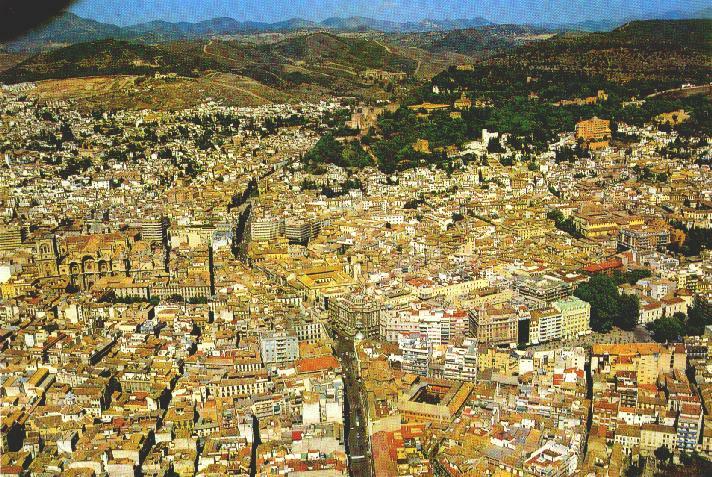 This is a nice areal view from the south south east looking right back uphill to the Alhambra (top right) and the Albaycin (top left). Left center is where you can just make out the huge cathedral that Ferdinand and Isabella had built to commemorate conquering the kingdom of Granada.